How Much Should You Pay Your SaaS Startup's Sales People? How much should your startup pay its sales people? According to Pacific Crest’s Annual SaaS survey, 9% of a sales rep’s annual contract value. This figure doesn’t vary much on whether your startup’s salespeople are inside reps or outside/field sales reps. The table below computes the effective salary + commission of a sales reps as a function of average contract value and an estimated quota. The quota is an estimate based on deal velocity, how many deals a salesperson must close each year to attain quota. Let’s walk through it. The first row shows the annual contract value (ACV), followed by an estimated quota. Dividing the quota by the ACV yields the number of deals closed per year. This is a sanity check to make sure that sales reps don’t have an unreasonable number of expected customers to find. It’s rare to see salespeople consistently close more than 2 deals per month (unless the company has exceptional product/market fit). Note, we’re not discounting these figures by quota attainment figures which is typically 80% purely to simplify the calculations. Next, we calculate the annual commission at 9% of ACV and assume that commission is 50% of total compensation - so we double the commission to figure the take home pay, excluding benefits, of a salesperson attaining quota. Why is there such consistency across companies in the 9% figure? It has to do with ensuring the salesperson’s efforts which are to generate revenue for the business more than adequately cover their costs and the costs of the rest of the company. If we assume the 9% is only half of the total compensation, then the sales rep truly costs about 18% for take-home pay, adding 15k for benefits per year likely increases that figure to more than 20%. The remaining 80% must cover the marketing spend, customer success team and sales development costs - in other words the fundamental unit plus product and engineering costs. 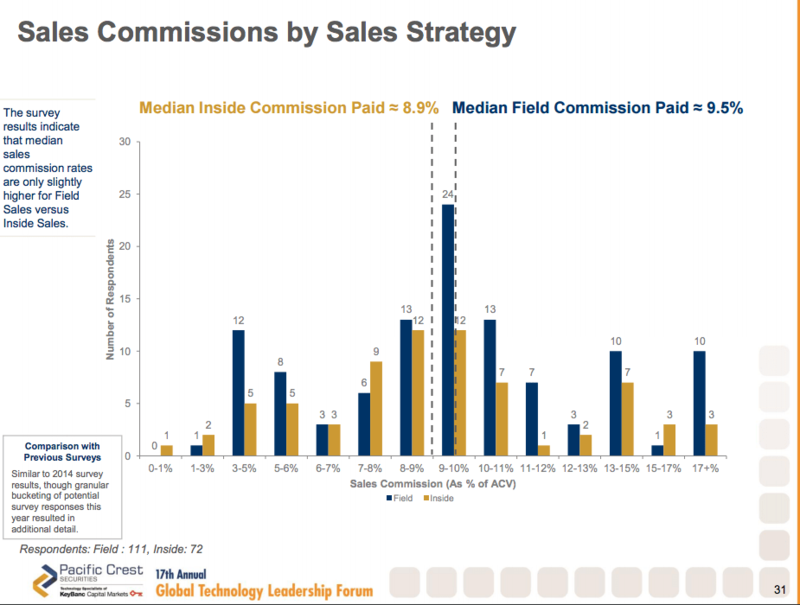 When planning your startup’s sales commission plan for next year, consider using these benchmarks.